This is a story about life and death, a memoir based on a part of my history about which I never imagined writing. But loss has driven me to try to find answers in what remains, to airlift myself to a place that serves me better than helplessness and misery. To reach out. This is my love letter to what lives on beyond the devastation. The child of Greek immigrants and raised in Collingwood and Doncaster, Mary Coustas grew up to become one of Australia’s best loved television actresses, particularly for her portrayal of Effie in Acropolis Now. Now, in her autobiographical book, she shows another side from her funny girl image. 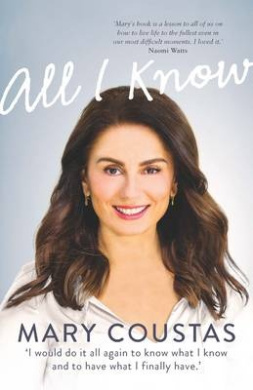 All I Know shares Coustas’ life story, with a focus on the loss of her much-loved father, and her attempts to fall pregnant after meeting the love of her life, George. Coustas is honest and open,at times funny and often rawly heartbreaking. Fans of Coustas will love the chance to get to know her more intimately, and those who have struggled with infertility may find hope in her story. Oh a soldier’s life is a beauty in such weather but as soon as we get back into dry billets we forget all the hardships. It’ powerful in what good spirits the boys keep. They laugh and joke over it all, as if it was the fun of the world. Archibald Albert Barwick was 24 years old when war broke out in 1914 and he joined the AIF. Leaving his job as manager of a sheep property in NSW, he trained with the expeditionary force in the 1st Battalion and travelled first to Egypt, then Gallipoli and later the Western Front. Along the way he rose to the rank of Sergeant, was injured three times and was awarded the Belgian Croix de Guerre. Significantly, he also wrote prolifically, filling sixteen diaries over the course of the war, detailing his experiences and insights. In Great Spirits: The WWI Diary of Archie Barwick offers Barwick’s diary to contemporary readers. Condensed from the initial 400 000 words to around 130 000 words in order to make it manageable, the writing is otherwise only lightly edited, so that the sense of Barwick’s personality shines through, managing to be humorous, honest and heart-wrenching by turns, so that the reader can journey with him in a very personal way. Of interest to historians of all levels, this is also a valuable read for any Australian to get first hand insight into Australia’s involvement in World War 1 and its impact. n her first book there’s a Bear in There Merridy Eastman shared her life away from stage and the small screen working as a receptionist in a brothel. Her second book Ridiculous Expectations shared her story of travelling to England for a book tour only to meet and fall in love with a handsome German named Tom. Now, in her third book, the story continues. Right. This was it. There was no turning back now, I thought, glancing at the tall German sitting by my side as we sped down the A92 towards Munich. here began my new life in Bavaria , with a man I’d met eight months earlier on a jetty in Lymington. ‘Your thing is on inside out, he’d said then, gently touching the sleeve of my cardigan. In her first book there’s a Bear in There Merridy Eastman shared her life away from stage and the small screen working as a receptionist in a brothel. Her second book Ridiculous Expectations shared her story of travelling to England for a book tour only to meet and fall in love with a handsome German named Tom. Now, in her third book, the story continues, with her arrival to live in Bavaria, four months pregnant and unable to speak German. How Now Brown Frau does pick up where the second book left off, which will delight fans of the previous books, but is also self contained enough to read on its own. 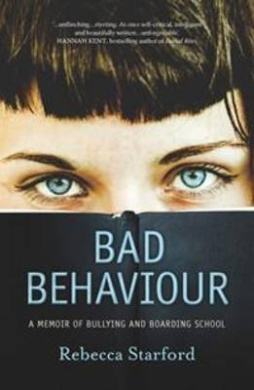 Eastman is forthright and funny, sharing her experiences with an honesty which is delightful, and often laugh out loud funny. What I was attempting was nothing less than rebuilding my credibility, and the only way I was going to succeed was with a mammoth effort. Geoff Huegill (widely nicknamed Skippy by friends and fans) is one of Australia’s best known and best loved swimmers. From the age of four until he was 26, Huegill lived and breathed swimming, training daily and winning an impressive array of medals including Olympic silver and bronze, five world champion titles, eight world records and five Commonwealth Games gold medals. But in 2005, exhausted from the years of training, and suffering depression, he quit. Two years later, having gained 45 kilos in weight and hit rock bottom, Huegill returned to swimming, determined to regain his fitness and get his life back on track. In 2010 he returned to Commonwealth Games glory, with two golds and a silver. More importantly, though, he had turned his life around – proving to himself and the world that he could follow his dreams. Be Your Best is Huegill’s story. Starting with his childhood and early involvement in swimming , through to the sudden death of his father when Huegill was 12, and he highs of his swimming career, the book then examines what went wrong before moving on to how he managed to get his life back on track. A special section in the middle of the book also details Huegill’s Be Your Best principles, which he promotes with his business partner Keith Staggers. The text is written in Huegill’s honest, straightforward voice. He admits his failings and is honest but not boastful about his strengths. Coloured photography throughout the book also charts his story. Fans will love this offering. Concealed by the shadow of a large water tank, I sat on the heel of my right foot. The air was sweetly pungent with the smell of ripening bananas and palmyra fruit. Cicadas buzzed relentlessly as a blazing sun rose to evaporate the condensed dew in the fields we had just scurried through. The small sparsely-populated village was luscious with its manioc and banana plantations, palm trees, and water birds in flight. But all this was lost on our small platoon of twenty-two; over half of us young women. Appreciation of beauty is a luxury of the untroubled mind. Niromi is the older daughter in a middle class Sri Lankan family, living a life of stability and privilege. She attends a good school and her family hope she will become a doctor. But around her, there are rumblings between the ruling Sinhala and the minority Tamil. Until now Niromi hasn’t really been aware of difference, but once she begins to look, her world changes. As she moves through her teenage years, she feels the injustices more and more until finally she sees that the only way to move forward to peace and equality, is via the Tamil Tigers. This puts her at odds with her family and many of her local community, but she feels that if she is to hold her head high, she must actively fight. Tamil Tigress is not just a picture of one young woman’s fight, but of a culture torn apart by differences. Many in the minority Tamil communities feel pressure and there are many groups that spring up to fight for equality. But while they are united in feeling oppressed, there is no unity in their approach. This leads to infighting and fighting between freedom groups. In the middle is a teenager, passionate about her country and her people, but confused by the infighting, and horrified by the deaths of her friends and close allies. Sri Lanka appears a beautiful country with a rich history, but when even its name is perceived as an attempt to ‘de-Tamil’ its legacy, it must have some way to go to achieve lasting peace. An interesting, and deeply personal memoir of a life in Sri Lanka. If you are a parent, teacher or librarian with a love of children’s books, chances are that you are well familiar with the illustrative brilliance of Ron Brooks. As the illustrator of some of Australia’s (and the world’s) best loved picture books, including John Brown, Rose and the Midnight Cat , Old Pig and Fox , Brooks has captured the hearts of readers for 40 years. In Drawn from the Heart, however, Brooks shares far more than his illustration work with readers. Reading this memoir is an intense experience. On the face of it, this is a book which traces Brooks’ life through childhood, study, marriage and raising a family, whilst also detailing the process of illustrating his various works. However, it quickly becomes clear to the reader that this is much more. This is a story into which the reader is drawn. Brooks is honest and intimate, creating a sense that he is telling the tale just over a cup of tea across a well-worn kitchen table. The reader is invited to cheer, to smile, to weep and mourn with Brooks. This is definitely not a dry-eye book. There is lots of factual information imparted – the detail of the creation and publication process of each of Brooks’ picture books is fascinating – but at the same time you are left a real sense of Ron Brooks as a person of great intensity. A must read for anyone with a passion for children’s books and illustration, this is also simply a wonderful read for any human being. Jacki Weaver has been entertaining Australian audiences for more than forty years, ever since scoring her first big role as Cinderella at age fifteen. Gough Whitlam once referred to her as an Australian National Treasure, Les McDonald once called her a Gay Icon and the Sydney Morning Heraldcalled her a Household Name. Whether she’s any of these, Jacki Weaver has certainly achieved wide recognition and great popularity in that time, as a star of Australian stage and screen. In Much Love, Jac she shares her life in a frank account of her ups and downs. Through her five marriages (and numerous other relationships), her professional highs and lows, personal challenges and triumphs, Weaver speaks to the reader in a chatty, natural voice which makes the reader feel she is there talking across the kitchen table. She is honest about and unapologetic for her life – she simply tells it as she remembers it, with the disclaimer that she admits that, as a memoir, there are people and events not touched on, for various reasons. This is a highly readable memoir of a fascinating life.